Bell is continues to impress us with the quality, performance, and style their products always have. 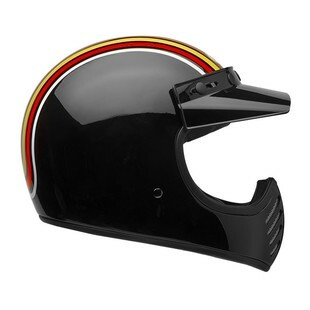 The Bell Moto-3 Stripes Helmet is coming at us this Spring and staying true to the retro styling where it was originally born. The new Moto-3 Stripes takes you right back back to the era of Steve McQueen and John Penton. Back when men were men and no obstacle or injury could keep a man from crossing the finish line. The Bell Moto-3 has been reborn with modern comforts while staying true to the vintage styling of its ancestors. This helmet will come with 3 different shell sizes for a more personalized fit with a lightweight fiberglass composite construction. The removable liner is washable and consist of a anti-microbial terrycloth. The Bell Moto-3 will, of course, meet DOT standards but it will also be ECE certified. If you are looking for a lid with modern features, vintage styling, and a unique look sure to turn heads, the Bell Moto-3 Stripes might be the brain bucket for you.